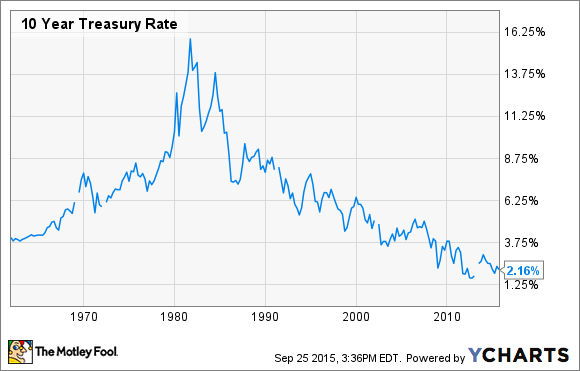 Interest rates don't seem likely to repeat their course over the last half century. The next half-century of finance is likely to be very different from the past half century for one reason: interest rates. You can see this in the chart below, which shows the key long-term interest rate benchmark in the United States (10-year Treasuries) going back to 1962. The first thing to note is the period from 1962 to 1981. Inflation became a serious problem after the United States used deficit financing to pay for the wars in Korea in the 1950s and Vietnam throughout the 1960s and 70s. It then turned into an outright crisis when oil prices soared following the OPEC oil embargoes of the 1970s, causing consumer prices to climb uncontrollably. The Federal Reserve responded by raising short-term interest rates well into the double digits. The Federal Funds rate, the rate banks charge each other to borrow excess reserves on an overnight basis, topped out at 19% in 1981. This kicked the United States into a recession by driving down both the demand and supply of loans, the effect of which was to reverse the direction of inflation and interest rates (and led to the election of Ronald Reagan). The second thing to note is the period from 1981 to today. It's not too much of an oversimplification to say that this stretch was nothing more than a three-decade-long normalization of interest rates. As rates went down, borrowing costs dropped, allowing baby boomers to supplement their incomes with debt. This boosted consumer spending and fueled the economy. Just as significantly, for financial companies at least, is the fact that falling interest rates translate into higher bond prices. You can get a sense for the impact this would have on banks by looking at JPMorgan Chase's (NYSE:JPM) balance sheet. As of the end of the second quarter, JPMorgan Chase held $318 billion worth of fixed-income securities. If rates were to fall for the next 30 years, JPMorgan Chase would get a continuous boost to its book value from doing nothing more than simply holding these investments. But this trend is now over. 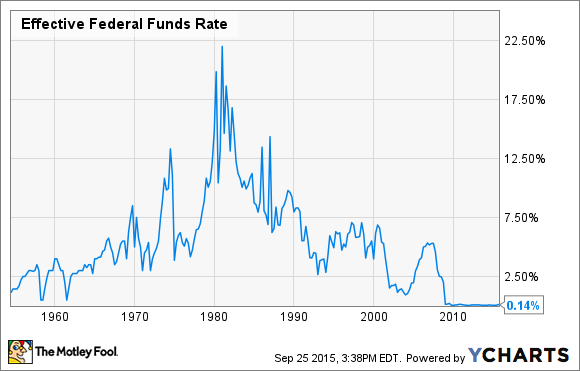 The Fed Funds rate, for all intents and purposes, is as low as it can go, currently hovering between 0% and 0.25%. Thus, there are only two directions for interest rates to go from here: sideways or up. And neither is particularly good for banks, as the inverse relationship between bond prices and interest rates works in the opposite direction as well -- namely, bond prices fall as rates rise. Take Citigroup (NYSE:C) as an example. In its latest 10-Q, Citigroup estimates that an increase of 100 basis points in short-term rates will translate into a $3.9 billion drop in the value of its securities portfolio. Because this more than offsets the additional $1.9 billion that Citigroup is projected to earn in annual net interest income from higher rates, it will take three years for the nation's third-largest bank by assets to recoup the initial drop in shareholder value caused by higher rates. My point is that we're in uncharted territory. As JPMorgan Chase CEO Jamie Dimon noted at an industry conference last week: "Interest rates have been so low for so long, that not only have traders never seen interest rates go up, but their bosses have never seen interest rates go up [either]."